We all know it’s important to schedule routine oil changes to keep our cars running in tip-top shape, But it’s important to extend this rule to the appliances that you use in your home. In order to keep working properly (and avoid costly repair fees) appliances like your fridge, air conditioning unit, and dishwasher need regular maintenance. According to The National Association of Home Builders, most of your home appliances should live upwards of nine years. Your fridge, for example, should live up to 13 years. By using your appliances according to the manufacturer’s guidelines and having them serviced regularly, you can extend your appliances’ life to extend even longer than the average lifespan. 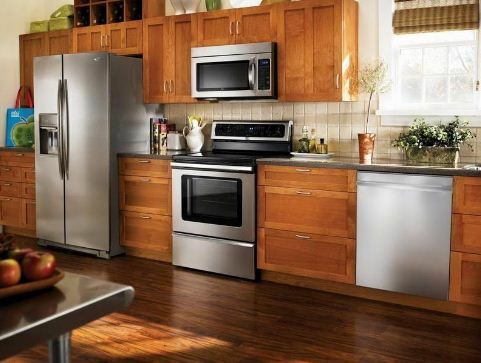 Refrigerators are among one of the longest lasting appliances you’ll own. One simple but crucial thing you can do to keep your fridge working like the day you purchased it is to clean its condenser coils. If they are covered in dust or pet hair they won’t efficientlycool the air used in your fridge. All you have to do is look up where the condenser coils are located on your particular model (usually underneath the unit), unplug your fridge, and use a vacuum with a brush attachment to clean off all the debris that tends to build up every year or so. Air conditioning units are incredibly important to maintain because they are essential to the air quality of your home. By reducing the humidity, people can enjoy cooler temperatures and air that’s easier to breathe. One way to keep your air conditioning unit humming is to clean the outdoor unit to ensure proper operation. Simply go outside every so often during the summer to make sure there’s no debris collected on top of the unit. During the winter, be sure to cover it in a tarp to protect it from the elements. You’ll be able to accomplish most maintenance tasks on your own, but there are times when you will need a professional. It’s important to hire local professionals with years of experience to help with more complicated things like checking motor blowers or refrigerant levels. For expert appliance repair services in Toronto call Toronto Refrigeration. Their experienced repair technicians provide fast, efficient, and affordable services 24 hours a day, 7 days a week, so you never have to worry if you find your maintenance routine hasn’t done the trick and you need expert help. After their visit and a speedy repair, these technicians can suggest even better maintenance tips, so you can get back on track and extend the life of your appliances.